1CLICK DVDTOIPOD converts DVD movies and episodes to iPad, iPod and iPhone compatible files, quickly and easily. Utilizing our famous CPRx error correction technology ensures the highest level of success when converting the latest generation of DVDs. Now you can convert all your favorite DVDs to iPod compatible files with just one click. Unlike other software with complex settings and multiple steps, 1CLICK DVDTOIPOD is easy to use. Movie and episode detection is automatic and doesn't require you to preview or try and guess which files to include. Just click the Start button and return to find your DVD converted. This software is perfect for those on the go who want to watch their movies while riding the bus or train. Now the kids can watch their favorite movies in the car on the way to the cottage. Supports iPad, iPod and iPhone. Supports all iPod video resolutions. Handles complex DVD movies with multiple angles. Converting a DVD is simple - Insert a DVD and click the "Start" button. The User Guide contains additional information and explains the software in greater detail. 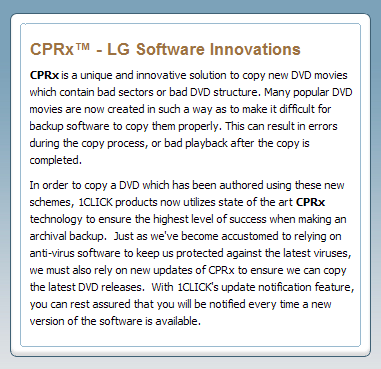 Go to the DVD Copying Software page for more information on copying DVD movies.